Epigenetics is the branch of science which involves the study of heritable changes in the gene function without any mutation of the DNA. Epigenetics has the ability to influence DNA transcription and translation. The epigenetics application and end-user base is expanding with the rising number of scientific discoveries. This factor is propelling the growth of the epigenetics market globally. According to the National Cancer Institute, cancer is among the leading causes of death worldwide, for which as per a recent study, epigenetic inhibitors consist of the characteristics and functions which have the potential in cancer prevention and control. This factor has provided an impetus to the research conducted on epigenetics in the oncology industry. 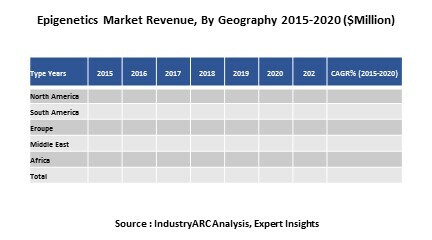 In the forecasted period between 2010 to 2020 the epigenetics market is expected to remain aggressive as the number of new entrants in this market will keep rising with the constant advent of new technologies coupled with enhanced features. On the global frontier, North America is projected to hold a major share of the market revenue followed by the emerging markets of the APAC region. A detailed qualitative analysis of the factors responsible for driving and restraining growth of the Epigenetics Market and future opportunities are provided in the report. This report on the Global Epigenetics Market identifies many such insights and M&A opportunities, besides providing a detailed analysis of the Epigenetics market. 11. Company Profiles (Overviews, Financials, Product Portfolio, Developments, SWOT Analysis).